Home // Uncategorized // So Which Study Bible Do You Recommend? 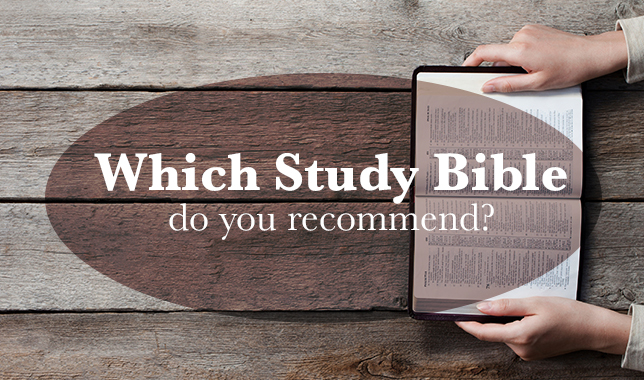 So Which Study Bible Do You Recommend? I currently use and recommend the ESV Study Bible. The English Standard Versions is a faithful, recent English translation of the Hebrew, Aramaic, and Greek texts of the Bible. It is an “essentially literal” translation that emphasizes “word-for-word” correspondence with the original text, rather than a “thought-for-thought” or “dynamic equivalence” approach used in some other translations. The notes help bring clarity and understanding. I find the insights and applications in the verse-by-verse notes that accompany the text to be consistently helpful. The 40+ articles on a variety of topics make it like having a basic theological library all in one volume. There is a wealth of learning here for those willing to read and study. The editors and contributors are experienced and trusted. The General Editor is Dr. Wayne Grudem, whose Systematic Theology I also recommend highly. The theological editor is Dr. J. I Packer, long a respected evangelical theologian and leader. Of course, in my weekly study and preparation I read and compare the original texts and a number of English translations and paraphrases including: the King James Version, the New International Version, the New American Standard Version, the New Living Translation, the Message, and others. I encourage you to do the same. However, if you only get one Bible to use in your daily reading and study, I highly recommend the ESV Study Bible. It’s available in our Ingleside Bookstore (as well as online) in a variety of bindings and price points. I really think you will be glad you made the investment!